Okay, we've been looking at all the trees, but not yet the forest. Before examining several important custom components, let's pause and see what we've got. Behold, the final "WurliTzer II" hybrid instrument! Yikes! There's a lot there -- wot hath got rot? Having built this absurd elaborate thing, I'm going to have to learn how to play it (I sure sounded pretty stinky at first -- phew/p-u!). What's the old slogan, "never wish too much for something; you might get it!"? Just so. But there are some conveniences you watched going together above that should assist in the many uses the new setup will be put to. First and most important, the keyboards, or now let's call them by their organ terminology, "manuals," are positioned closely together. There is just enough space to slide your hand in between each, to adjust the many K2600 sliders and buttons. You have to use the "Braille" method, but that's generally all you need during performance. In fact in this configuration the whole instrument is just that, a PERFORMING instrument. Frequently, though, it's necessary to gain full access to each front panel and display, for sound design and program editing, for global adjustments and loading or saving files. No problem. With a quick lift of the hand the individual upper tiers all swing smoothly upwards, pivoting about their centers of mass. The process looks like this, starting with the music stand only, then continuing down, until the bottom 2600 is wide open. Within several seconds you can be working away at any of the synths, in sound design configuration. There's plenty of space to work comfortably, even for hours at a time, as you can see next. This is the worst case, the lowest K2600, opened up for easy access. 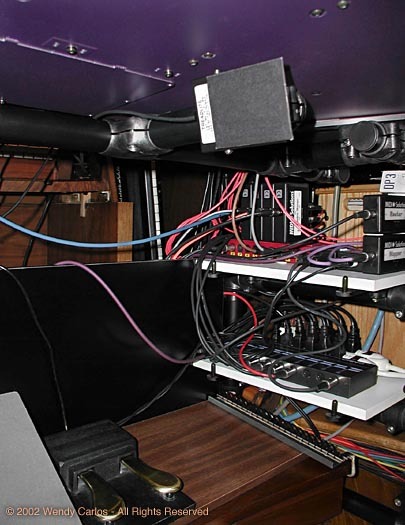 (Note that every tier, including the music rack, has those soft, firm foam bumpers on the underside, so there's never any fuss about if you are in place or not. The music stand halts exactly horizontally, so no music will slide off. When you're done, you quickly return to the performance configuration. After all of this was working correctly the extra Ultimate Support parts arrived, and I was able to build the swinging shelf for the Mac G4, which had been prototyped as you saw earlier, to be sure that in practice it could all be made to work. The design was again a matter of trial and error, eventually zeroing in on an elegant triple cantilever design. Once more, after two more diagonal support braces were added, the whole shelf, even with the Cinema Display in place, became stable and solid. The stack of synths is quite heavy, and there's not the slightest feeling that anything will topple over at any angle of the G4's shelf. There was no need for any of the rotating fittings to be tightened very far, which means the friction is low. To work with the computer you need only a light touch of one hand to swing the shelf over to you as you see here (BTW- note the recursion of the monitor's image, in the top view, too -- couldn't resist the temptation, subtle trickery). When you're not using the computer, just move it away far right, like the second view. While practicing and playing you can simply ignore the whole computer wing. That's a hint of the change of focus brought about by the new instrument, when compared with the original studio setup (the Something Old section). Remember those computers are right beside the keyboards all of the time, in a one-line-at-a-time workspace. It was very rare that I'd even consider sitting down just to play or practice in that environment. Well, now I'm doing it all the time. I leave the G4's shelf all the way to the right, turn on only the sound making instruments, sit down and... (what's a keyboardists word for "wail away"?) dig in. In other words, this LOOKS and ACTS like a self-standing musical instrument, and my reaction is to treat it that way. I find myself playing all sorts of music on it: classical - popular - jazz, writing out new compositions when inspiration often strikes (using just a pencil and manuscript paper -- wotta concept! ), and improvising freely for hours at a time. The multi-manuals and pedalboard encourage a more spontaneous way of working. For recording I'll undoubtedly return frequently to the care and polish of solo lines one at a time. But guide tracks and many final tracks, will come from this more intuitive way of making music. Stay tuned for how it all turns out! Since some of you have asked to see a shot of me at work on the Wurly II (we've also just added a photo of Clark Ferguson seated at his 5 manual instrument), let's include this photo with me practicing (slowly I'm getting less stinky). Thanx to writer Carol Wright, who was visiting NYC and had stopped by for a rare f2f and took this good shot. My fault that the new digital camera was set rather dark for dim lighting, so the original image is slightly grainy and underexposed (improved in PhotoShop here). But it has a nice moodiness about it, and provides a sense of scale for the completed rig. Real organists will probably groan to note that I've been reteaching myself the pedalboard barefooted (sorry!). It's so clean, slippery and shiny, and since I sure don't wear gloves for the manuals, I thought I'd break another rule for awhile. It's fun to work up a rapid toe-heel swivel technique by feel alone that's precise enough to play moderately fast melodic passages with one foot when the other's too busy. But the main reason is for the touch sensitivity and expression, which are less accurate if your feet can't feel the keys, and any shoe reduces the tactile feedback. What can I say -- try playing a dynamic passage on a piano while wearing leather gloves and judge for yourself how this affects your performance nuance and control. Among the several important custom components, one of the most useful is an implementation of traditional pipe organ "pistons." These are the compact round push buttons found beneath each manual. Usually there are between 6 and 10 of these, although very large instruments might have 20 or more on some manuals. I checked around until I found an existing product which can send MIDI program change commands simply. There are three RFX MidiBuddy boxes, and one somewhat more deluxe MidiWizard (used for the Great manual). These devices are really intended for foot use by on-stage musicians, thus the buttons are quite large, and take a bit of pressure to toggle. While Radio Shack is convenient, I also use Mouser on-line, a reliable source of hard to find electronics parts. That's where I next ordered several kinds of press button switches to try, ending up with some dandy Tact switches made by Mountain View. They're about half inch cube in size, including the color cap/button. I planned to number each of the ten white caps with the usual large digits found on organ pistons. But so far I've not needed to. There are two small foam strips you can easily detect by touch or a glance to separate the buttons: first two ranging buttons (blue = down by 10, red = up by 10), then the two groups of five white buttons (0-4 and 5-9). I've spaced them to match the white keys on the manuals, they easily fit, and the notes provide a simple way to remember which one is which. To the left below is a photo of the underside of one of the strips, here resting on top of the MidiBuddy box it's connected to. This is a homemade construction, using a very heavy duty solid matte black art board you can find in art supply shops. Two layers are glued together, and then the whole thing is given six coats of a high quality clear matte lacquer. It's steel wooled for a smooth finish, and the switches are glued into position following a template. With a Dremel tool I drilled tiny holes to allow the wires to come from behind. It was a tedious task next to "make like a printed circuit", and end up with a decent connection to everything which was electrically sound, neat and compact. It took about 20 hours for each complete strip at first, somewhat faster at the end. Then the other end of the ribbon connector wire was snaked into a corresponding box and soldered in place, using short lengths of heat shrink tubing for a neat and sturdy connection. Due to many cramped short stiff wires I discovered a few poor connections after completion, even though they looked fine by eye. They had to be found with a multimeter and methodically repaired. On power up I rechecked that the correct digits were being triggered. Yes! The four units are mounted on small shelves to the left of the synths, then the piston strips are secured with heavy duty foam mounting tape to the front edge of each manual. They're also slightly tipped up at the bottom, making the buttons very easy to press quickly and without fuss, even in fast, busy music. In the right view you can see two of the piston strips mounted in place. A somewhat later brainstorm was that there should be something equivalent to a real organ's Coupler stops. These allow the sounds from one manual to be played from another one, usually the Great manual, adding more to what's already there. My couplers started as a trim, black vinyl clad, cast aluminum mini box, and five premium DPDT bat handle mini switches, all of which I ordered from Mouser. 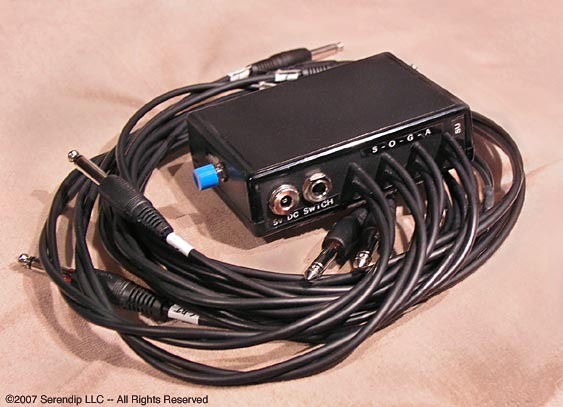 They also stock some durable metal cover DIN connectors, the same as on the best MIDI cables. I put this new device together in about eight hours, including the measuring, drilling, soldering, final cabling, testing and marking what goes where. The two pole switches now interrupt both active MIDI lines. I tried it out, and was pleased it worked right away. 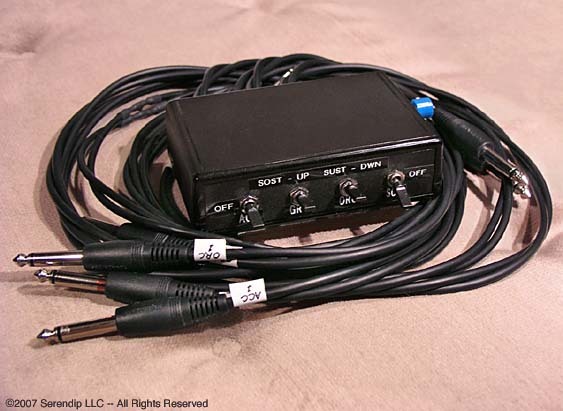 It takes the MIDI data from a self-powered MIDI Thru box, via the switches to the four MIDI Mergers from Midi Solutions. There are four inputs on each merger, and they're logically crucial to the function of the whole setup. Everything is shielded, and seems to behave itself fine. The last touch was adding five homemade paddle-shaped handles to the switches. These are fabricated from the same heavy duty black art board, cut following a template into smaller versions of the usual WurliTzer stop tabs. The legend on each came from the Laser printer, at 1200 dpi, using an image made in PhotoShop. The print is in a narrow sans serif font for the front acronym, a nice cursive font for the full name behind, again following traditional WurliTzer look. These are again covered with clear lacquer, and when dry, epoxied in place to the bat handles. Those handles are first each given one wrap of smooth tape -- in case any of the handles have to be removed in the future, the tape ought peel away with some care. The left photo shows the finished box before installation. Looks good, huh? To the right it's in place, along with three MIDI Transpose boxes (I hid the Anatek original art with something that matches everything else better). There's a homemade extension panel mounted on the tiny Anatek buttons, much larger, and labeled with three circles: "Flat - Toggle - Sharp." A press of Flat or Sharp jumps up and down by octaves, the usual choice. Toggle returns to no transpose and back again. You can also hold the center button and pick any other interval (you play a note above or below mid-C for that) to transpose by, allowing for some wonderful new coupling intervals. The center homemade coupler switch, "MIX" is unlike the others. It makes use of a MIDI Router box (from MIDI Solutions), to rechannel played notes so they call on some special "mixture" programs I built recently. These can emulate the richest of pipe organ mixtures (in addition to other actual mixture samples). More often they trigger selected secondary ranks and layers, adding depth and color to a given ensemble. This creates some very tall registrations, indeed, especially when added to the other couplers. So far only the Great can call on the mixture additions, which are borrowed from the Orch manual's 2600 most of the time. I hope you can see from all these photos and detailed descriptions that the idea of "hybrid" applies not only to the often dry technology we've been discussing, but also to the "look and feel" of the Wurly II. I didn't want a sterile factory polished instrument, but rather something more dynamically changing, a bit retro, and kinda fun to look at and play. It had to be practical and well built, too. There's a broad area between being too serious and being scatterbrained. The idea was to aim for something between stiff and flip -- to come up with much more than a toy, but not forget the second meaning of a word musicians use all the time: "p - l - a - y." I don't see why you can't at least try to combine both, and enjoy much of what you're doing, so that the tedium and tenacity behind anything worthwhile is also never very far from a grin. Don't laugh about a knee-switch. It "woiks"! Larger cinema organs often place a small round sustain toe button at the top of their master expression pedals. The same muscles are used both for both phrasing and sustain, which I find trickier to control, easy to tap accidentally, too. If only an attached piano's sustain is activated, you can deal with it. I've been told that Hope-Jones (more about him later) also provided a sost pedal effect on some instruments, but I've never seen any examples of that so far. 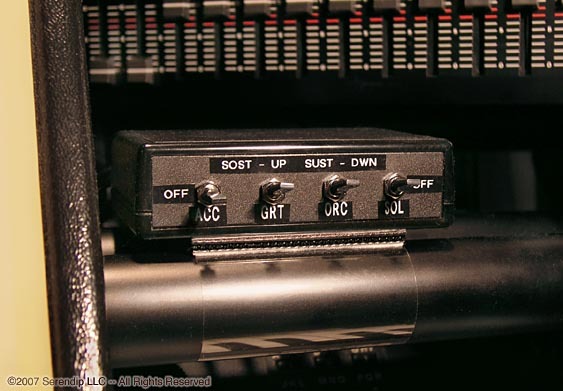 (Update: Since writing this desciption, I've learned that a few pipe organs using new solid state relay controllers now provide a similar sost effect, via the toe button. Kewl.) 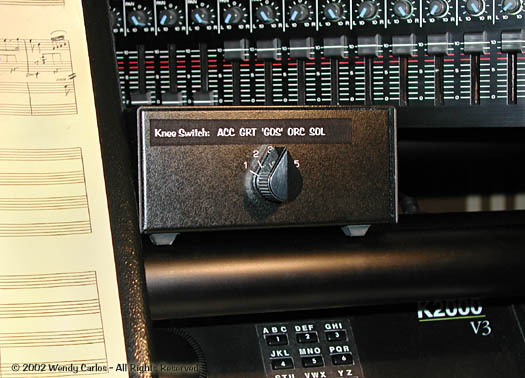 A knee-switch uses very different muscle groups than an expression pedal, orthogonally 90 apart. That's very much like the left and right channels on old Westrex stereo LP's -- it's not hard to keep them completely separated, primitive brain functions (all we eventually are left with, kiddies... ;^) can cope with it easily, I find. This is something new and offbeat, and it will take some practice to learn to use effectively. The concept allows holding down any melody line or chord, as you often do on a piano, so you can reach quickly to a different manual for a counterpoint or decoration. Don't forget, once the switch is pressed, new notes will not be blurred with sustain, as this is a "sostenuto pedal," like the center pedal on a piano. Then you go back to the original manual, let off pressure on the knee switch, and continue the melody. Original WurliTzers used something nifty and different called "Second Touch" to accomplish some of this. I hope to build a second touch feature into both of the lower manuals eventually (turns out to be a bit trickier than the description below, which combined with giving up use of the intrument during the modification has contributed to the current procrastination). The plans and working drawings make it look "doable", at least, and there's a generous amount of space beneath the keys of the K2600's for another Gulbransen optical strip to do the job. Update on the Sostenuto Sustain Box: Turns out that having a smart soustenuto ability on an "organ" is quite a powerful extension. I've really become very fond of it the last few years. Although the original circuit for providing both sostenuto and sustain functions worked reasonably well, it was actually a kludge. I had to isolate the four Kurzweils from each other with resistors, since they were all being controlled by a single-pole kneeswitch. The synths don't like to have their control inputs strapped together in parallel, so I used 560 ohm resistors on each input, to "build them out" from the common SPST switch. At times one synth might "wake" up a bit slower or faster than the others at power-on, and it would falsely react to the resistance circuit as if it were a normally closed switch, not the actual normally open configuration used (the Kurzweils nicely sense the switches automatically on powering up, but here it causes problems). So it would behave backwards, turning the sostenuto function ON when the knee switch was released, OFF when the switch was pressed. Ick. I'd have to reset the synth manually when this occurred. As I said, a kludge. Above you can see what has now replaced it, front and rear views, some extras, and the final new configuration in place. The 5 volts DC for the relays comes from a small "wall wart" switching supply. There's a jack for the knee switch, one for the power supply, and eight leads for the synths, two apiece. It can be maddening to track down occasional malfunctions, so I added the small push button to "Test" that the relays all activate normally, even if the knee switch fails or isn't connected. The final device replaces that larger Knee Switch Selector box seen above. I wanted the box to be firmly mounted so one finger could be used to flip the toggle switches with ease (and not have it bounce or fall off). But the tiltable music stand rotates along with its black mounting tube, and the box would still have to sit securely on it. Can't glue or clamp it down to a moving support, alas. In a Eureka moment, I realized that the box could simply be attached via heavy duty velcro-like strips to two clear plastic cylinders which slip around the aluminum Ultimate Support tubes. It's a neat solution, and also allows the box to be slid left or right a few inches to find the best spot for easy access. Anyway, this is a small but welcome new addition to the Wurly II, and now you know about it (this description added just a couple of days after it was completed). 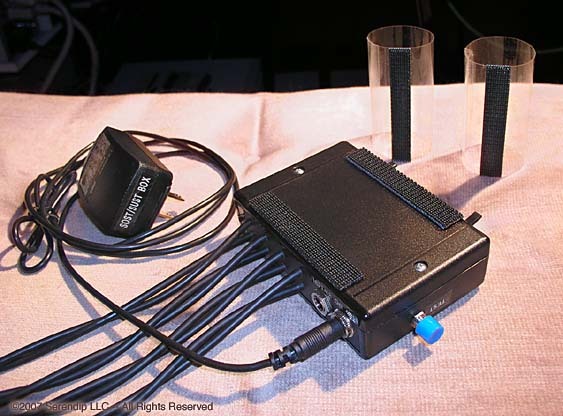 The third photo above shows the velcro-like strips on the bottom of the box and on the acetate tubes, and also the small power supply. Extras: There have been a few additions to the Wurly II in the past year which we ought include here. 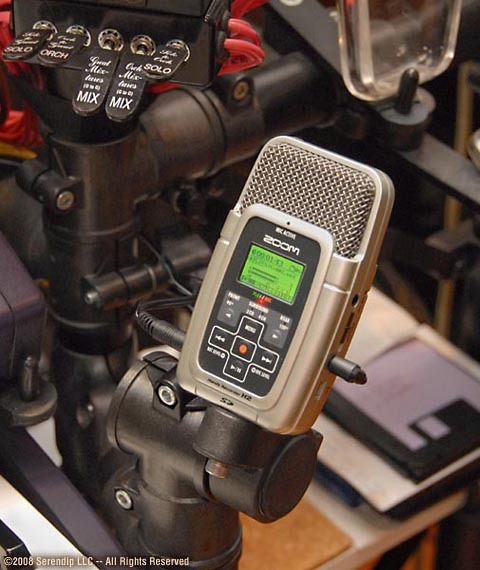 The most recent of these is a small "handheld" digital recorder, the Zoom H2. For quite awhile I'd been considering adding some kind of auxiliary "scratch track" recorder to the rig, to allow handy single take transcriptions to be made in high quality as I played along (Note: until recently my playing was pretty lame -- it's only this year that I'm willing to save any of it, as finally this here old dog [woof!] is picking up some skills of what is for me, a new trick.) 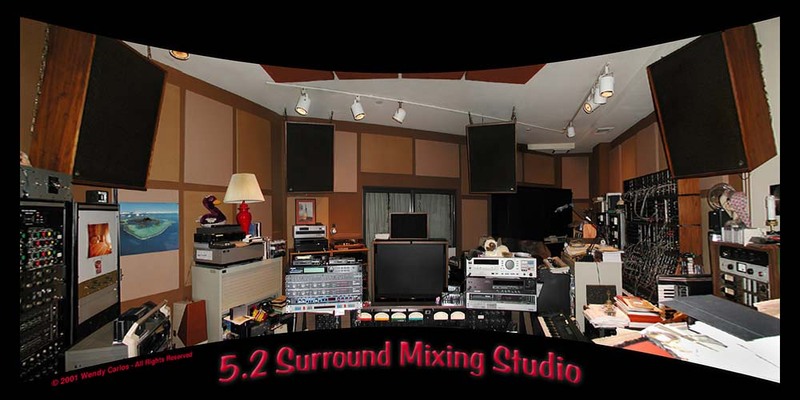 The idea was to avoid requiring the rest of the studio equipment to patched in, powered up and carefully adjusted, simply to record in the usual way. A few magazine reviews convinced me that one of the newest hand-holdables might do the job modestly and with little fuss or mess. When my friend, Manya, kindly brought by a new one she'd bought for work (besides being an amazing singer -- note the music I wrote for "Woundings" -- she's an audio engineer at NPR). "What's that?" "Here, take a look (she hands it to me)." "Hey, that's amazing, I had no idea these existed." "They do now. Try it out!" -- So I played with it awhile, and got hooked, filing the idea away for a future purpose. Like now. I initially considered the Zoom H4. But there were a few interface problems (clumsy level sets, for example), and I hesitated. Yet I trust the Zoom people, whom I met a couple of times in the 80s thanks to my brilliant engineer friend, Stoney Stockell. (Stoney developed the excellent GDS and Synergy digital synthesizers, on which I've created so much of my music.) Zoom's equipment works well, is durable, sounds good, and you get a large "bang for the buck." The newer H2 also supports surround sound recording (yeay! ), more convenient level adjusting, and it's compact enough that I could also toss it in my bag, to capture spontaneous live audio with no fuss, bulk or weight. Now I use this neat little unit for a LOT of genre audio tasks. To do the job neatly on the Wurly II, I had to cobble together a simple mount with a few spare Ultimate Support parts. The angled base quickly slips over a new short riser on the right, in between the bottom most K2600 (ACCOMP) and the swingable Mac keyboard and monitor support. There's an external power supply plug nearby. I also had to assemble a small variable attenuator and adapter cable, to convert the output from the Wurly's mixer from 1/4" to 1/8" (both stereo plugs), and drop the +4dB studio levels to a "HiFi" -10dB level the small Zoom wants to see (at first it overloaded preposterously). Now with just a few button presses, I can make quick reference recordings, dump them over to the computer via an SD card, and I'm set to figure out what needs work, while composing or arranging new musical selections. Very handy (wish I'd done this before)! The studio monitor speakers were also not an ideal match for the largest pipe organ sounds. Their location also compromised the audio from where I sit, off to the side. 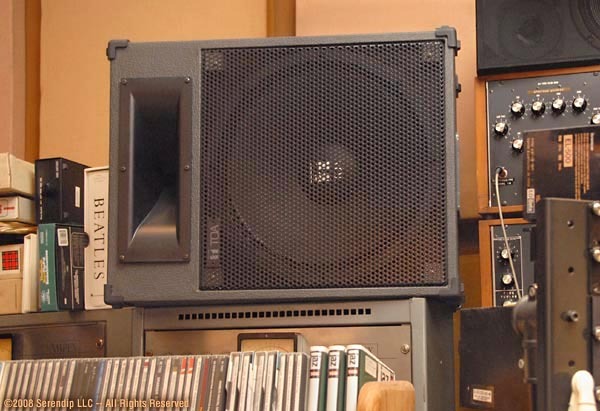 The first change, early on, was to dig out a pair of small TOA 280-ME monitor speakers not used recently. I placed them way up on top of the Moog Modular, and ran a power amp up to them. They helped, but at times struggled, too, on the most powerful pipe registrations. So I checked online for the current larger TOA studio / "club" monitor speakers. 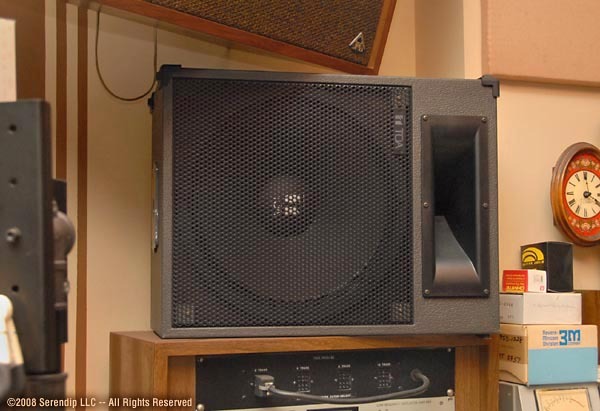 A pair of surprisinngly compact but heavy-duty SL-152 (15") models looked like they'd do the job with ease. These are now symmetrically placed widely apart, to each side of the console, reminiscent of typical Main and Solo theater organ chamber locations. From the above photos and comparison with the other earlier photos, you'll see where they are situated. As an aside, while working with the Wurly II, I've become far more aware of pipe organ techniques, arrangements and registrations. There's only so much you can learn by reading, studying books, charts, photographs, and listening to first-rate recorded performances. Up to now I never much felt the urge to "collect" antique bric-a-brac from the history of the organ. That's gradually changed. For example, I suddenly wanted to see and hold actual stop tablets from old instruments. Online auctions turned out to be an easy way to satisfy that wish. In the fourth photo above, you'll see three typical examples. 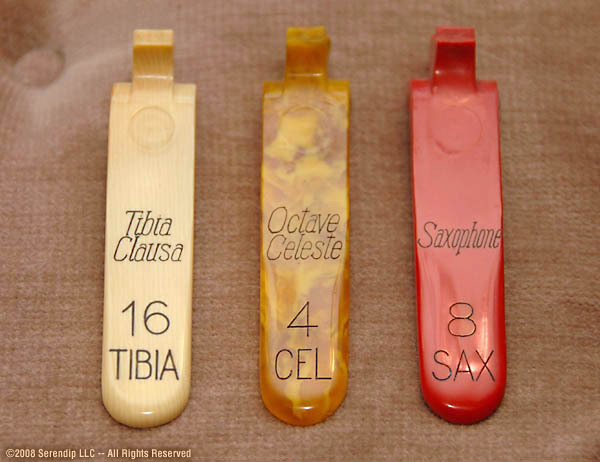 There's one of each of the three colors: Ivory (flues and percussion), Mottled Yellow/Ochre (string celeste ranks), and Red (reeds). Probably ought find a couple of Black coupler stops, too, to add to the two dozen or so others. I'm also obsessive enough (ha!) to take the time to sand out scratches, recondition and buff the vintage tabs, fill in that special dark gray color where it had worn out of some engraved legends. They look like new. Since my only experience with Wurlitzer consoles up close happened decades ago (on tiny instruments), this is the first time I've had a chance to examine vintage celluloid tablets, and the distinctive fonts employed for the engraving. I store them in a soft ziploc bag, take them out occasionally for visitors, or simply to provide an historical "reality check" on what once was, and what I'm trying to replicate here at long last. Kind of nice. I've also added a few more MIDI boxes to the interconnections, which I'll have to add to the schematic diagram below. And I've been slowly assembling a collection of several new toe-piston switches, with all sorts of MIDI triggering devices, which will probably be the next major addition. Again, these are modest expansions. 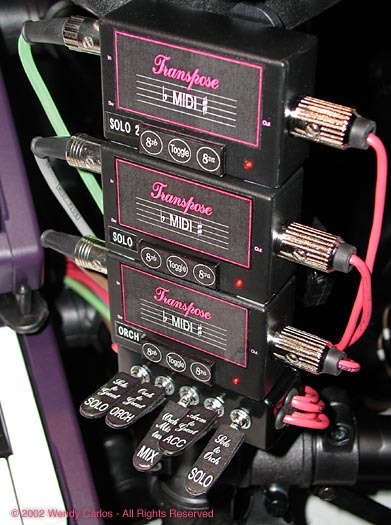 For example two added MIDI Solutions boxes now provide mixture stops to the Orch manual as well as the Great, and another provides a collection of convenient switch functions, handy at times. 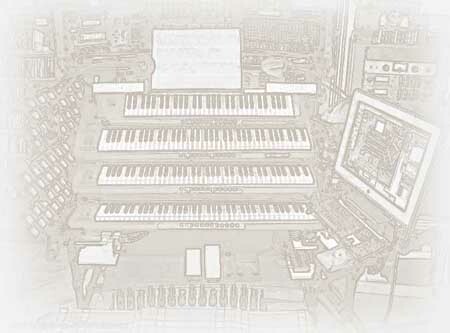 Like the description of this website as being a "Living Page", it turns out that the Wurly II is a "Living Instrument" gradually evolving and changing to adapt to new ideas that naturally arise with more and more experience using and performing on it. Over a year ago Simon sent me one of his informative messages which suggested that he might be in NYC for a 2007 summer organ convention of the ATOS he'd be performing in. He wondered if we might meet f2f. Indeed, that was our vague plan. As it turned out, the event was a bit earlier in the Summer than I expected, a possible conflict with my plan to get away for a long-procrastinated vacation before the heat waves struck. As luck would have it, I got back (from a great get-away) while the convention was just starting, and so we were able to set up a last-minute meeting. He was particularly interested in seeing and hearing my homemade hybrid instrument, so I invited him to stop by the studio the one evening he had open. We got together for about three hours of nonstop jaw wag about an eclectic array of wide-ranging topics. I gave him an informal demo of the instrument, some of the more unusual parts especially. He asked sharp questions as he took it in and compared it with his years of experience with big pipe organs. It was great fun to visit, and then hear him try out the instrument. 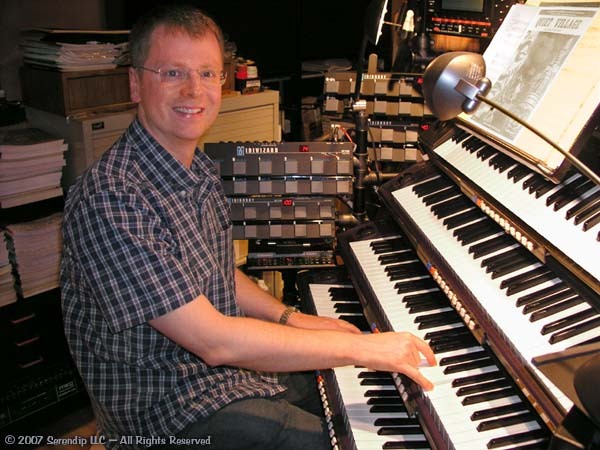 He sounded so much better than me on it, and thought the sound was really fine (Simon has written specs for several new installations and consoles, so he has lots of experience in pipe organ timbre and execution). He praised Mark's original samples a lot, especially the Tibia. But he admitted that the touch sensitivity on the Wurly II, mainly on the pedalboard, would take awhile to master. (Don't I KNOW it!) He was a very good sport, and we both enjoyed the evening greatly -- thank you, Simon! You can see the best space to mount a sensor strip is right in front of the base of the keyboard support. That's a 1:1 photo of the side of the Gulbransen sensor that's been placed into the drawn 2600 elements. Instead of using the "Nessies," it will be much better to fabricate some stiff, thin opaque plastic vanes, one per key, to activate the sensors only when nearing the bottom of key travel, and then do so quickly. A length of Latex rubber tubing will replace the Kurzweil soft rubber travel limit bumpers (losing the aftertouch sensor that's part of each, dammit! ), as the force at the bottom doesn't rise so steeply with depth when you use a resilient hollow tube. A small prototype with only two keys was used to work out that "important detail." I'll attack this major do-it-yourself project later on this year when I can set aside the time to do it correctly. Eventually we'll document it here for you (if it works...). Many of you may be interested to see what an actual Second Touch cinema organ manual contains. Here's a diagram from the British organ firm, Christie, which shows the underlying design of a single note on one of their instruments. You can study how the usual "springiness" of a wooden key was provided by one moderately large hairpin spring, and that a key could continue down smoothly until a small pad on the key's underside contacted a vertical post. This post was held upwards by a short leaf spring, which was two or three times "stiffer" than the main spring. Most electrical key contacts were made in the normal "first touch" position, others not until the key was pressed down an additional 1/8" or so. These 2nd touch contacts were slightly bent so they triggered only then, adding any number of additional sounds or ranks only to notes which were played with extra pressure and depression. A clever musician could create the impression of having a third hand via this simple mechanism (invented by Hope-Jones, who we'll cover next). It would be a "killer" feature on a MIDI keyboard -- too bad no manufacturer has come up with it yet! I've not yet gone into the many other families of sounds an instrument like this can produce. It's an increasingly eclectic musical world, is it not? 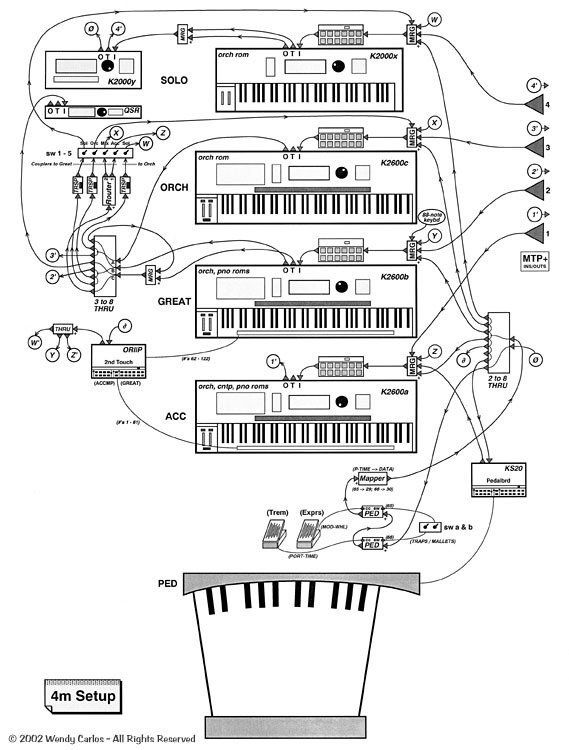 But for the moment let's end this section with a large scan of the current MIDI wiring schematic. Since it seems to change every few weeks, consider this as an overview, not necessarily up to date. And if you should try a similar rig as this for yourselves, I would strongly recommend working through the logic of the wiring on paper first. I just plunged ahead the first two weeks, and became hopelessly lost, "too many wires, my dear Mozart!" But the rest of the job went straight ahead once I began working out each newest plan first (grumble grumble...). Addendum: this is probably a good place to thank many of you who already have written about this latest addition to our website. Imagine adding something completely brand new one week, and already receiving thoughtful commentary and questions about it the next -- so much swifter a turnaround than any other form of publishing! Thanx to all for your feedback, suggestions and applause. 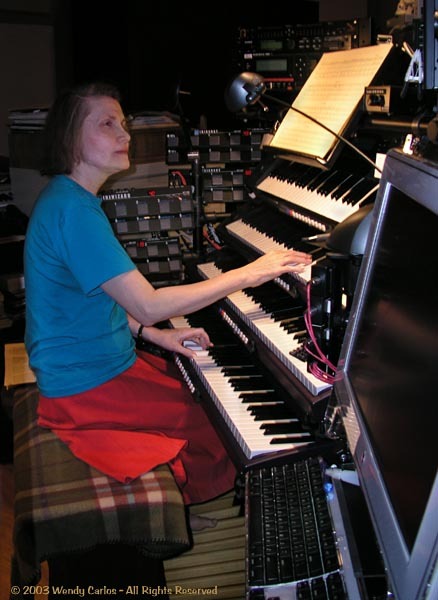 As an aside, I ought mention that I am familiar with several companies who provide devices which can connect keyboards up to synths via MIDI, but in more pipe organly ways, including Hope-Jones style "unification." In fact, the Artisan company is a pioneer in that method, and their Ranks in a Box system mentioned earlier uses just such an approach. You merely have to turn "local mode" off, then route all controllers through dedicated hardware, using "stop-tab" switches, one MIDI channel per rank. Four synths provide 4 x 16 = 64 MIDI channels, enough for a "really big organ!" Unfortunately, all such current systems use an organ metaphor, and therefore don't support velocity or pressure sensing, and several other notable MIDI features. That's fine if your goal is to duplicate the pipe organ tradition to the letter. As you've seen here, my interests extend to different directions. Sure, I do miss stop tabs. And the idea of unification would be quite useful even for non-organ sounds. If you can afford it, you might commission some appropriate custom hardware just for this purpose. Since I can't, I've taken the simpler do-it-yourself approach described here, ideas many of you may want to try. Perhaps eventually there will be an inexpensive solution to add individual stops, which organists take for granted, without giving up other MIDI features. In the meantime, with both its compromises and advantages, this is a powerful new configuration which also happens to be a great deal of fun to learn and perform upon. Text and all images by Wendy Carlos. Original logo and WurliTzer name registered TM of Rudolph Wurlitzer & Sons.